Based on Alan Bennett’s memoir and hit West End play, this brilliantly witty, “mostly true” story chronicles an unlikely friendship between a writer and an elderly eccentric. “The writer is double,” playwright Alan Bennett (Alex Jennings, Belle, The Queen) explains early in the film: “There is the self who does the writing and there is the self who does things.” The Lady in the Van is a story about the self who, however reluctantly, does things — in Bennett’s case, opening his door (or at least his driveway) to Miss Mary Shepherd (Dame Maggie Smith, My Old Lady, Quartet), an ornery, impolite, and bullying homeless woman who claims to take advice from the Virgin Mary. Despite his private nature, Bennett takes pity on the elderly woman and agrees to let her park her rundown van on his property for three months. It’s likely, however, that curiosity has as much to do with Bennett’s decision as does charity. Where did Miss Shepherd find this van? Where did she learn French? And who is the strange man (Jim Broadbent, Brooklyn, Le Week-End) who keeps coming round in the middle of the night? While the questions are many, Bennett has plenty of time to discover the answers to them, as Miss Shepherd tests the limits of his hospitality by stretching the original three-month stay into 15 years. 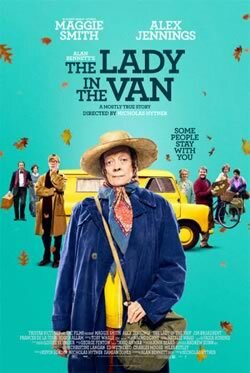 Directed by veteran Nicholas Hytner (The History Boys), The Lady in the Van is a playful, inventive, and relentlessly funny film that reminds us of the value of taking a chance on strangers — and of the long road that gradually turns strangers into friends. Figuring out what is true and what isn’t is one of the pleasures of The Lady in the Van, but the foremost one is watching Maggie Smith gloriously reprising her acclaimed stage performance. Can we buy the tickets on line?